Starting at the front of the bike Justin runs a Pro Taper Windham SX bend and they are a little rolled back. Factory Suzuki mounts are holding the bars and allow for fine tuning the height of his bend. Another factory component are factory triple clamps that come from Suzuki Japan. Hill and Reed run a different clamp on their bikes. The throttle tube is a Works Connection piece. The brake line and clutch cable are factory components.. The clutch lever is provided by ARC. The levers are a billet material for added durability. While Justin runs a half waffle design and grip donuts on his grips, Reed does not. A Factory Suzuki Japan front brake master cylinder is mounted to Justin’s Pro Taper handlebars with a SMC Japan front brake lever. A GET map switch sits next to the throttle on Justin’s race bike. This switch has 2 available maps that Justin can access anytime during racing. On the left side of the handlebars there is a kill switch as well as launch control button for starts. The team has several options to choose from when it comes to the steering stem. It can help with flex characteristics and rider feel. A Yoshimura lock nut is used to fasten the stem and triple clamps. You can also get another look at the Factory mounts made specifically to Justin’s preferences. Justin and Chad run their forks in different positions. While Justin is almost flush, Chad is around the line 2 or 3 mark. This is a stability preference between the 2 riders. Factory Showa front forks are added to the race bike with a blue coating seen above. This is a similar coating that comes on OEM model 250s and 450s. A Works Connection holeshot device is added to the front forks for Justin. It is place fairly low in position and is a single button. Front axle lugs are oversized and a large axle is used to go along with those lugs. It was deemed classified on asking about the actual material of the axle. The hubs and spokes are provided by Factory Suzuki in Japan and the hoops are an Excel component. The front rotor is over sized and the pads themselves are another part of the bike that is brought to the team from Factory Suzuki in Japan. Front and rear brake Justin likes a very stiff initial feel. Front brake rotor is provided by Galfer. Justin’s radiators are stock size and a brace is welded for extra support by the Cup shop. Some of the reinforcement is done at Suzuki Japan and the rest is done at JGR in North Carolina. The engines are all done in house at JGR in North Carolina. The team has several options to use as far as engine power and characteristics. During the off season riders can test to have the engine better suited for their personal preferences when it comes race time. JE pistons and Web Cams help with the development at JGR . JGR also has a cool logo inscribed into the head. CV4 provides all the radiator hoses to the team and on Justin’s bike. Brad mentioned it does help with consistency of water flow through the engine. JGR makes all their motor mounts/engine hangars with the help of SMC Japan. They are made in Japan and the drawing is done by the team at JGR. The team has several options to tailor the chassis flex to what the rider is asking for . Justin and Chad are running different engine mounts on both sides of their motorcycles. The clutch cable holder is made made in house at JGR. You will also see the Hinson ignition cover and akadizing that adds protection to the engine from debris. While JGR creates some of the coolest looking parts in the pits, they are not unobtainable. A lot of the pieces shown like the case saver here are available to the public and for sale on their website. All these parts are made in house at their home base in North Carolina. The shifter is stock with a Factory Japan tip. Justin likes to run it just a little higher in position than stock. The ultra sharp foot pegs on Justin’s bike are made in house at JGR. Completely titanium and mounted to a stock Suzuki foot peg mount. The foot pegs have the ability to be changed in height or position on the bike for rider preference. This is one area where Justin Hill and Chad Reed differ. Justin does run a larger boot and prefers his pegs to sit further back. We did notice that the thickness between Justin and Chad’s pegs were also different. The swing arm pivot is a titanium pivot with aluminum nut. A stock Suzuki sub frame is used but lowered for Justin so he has more room between his legs in the whoops. The chain rollers and chain slider are a stock Suzuki piece. On the rear a JGR guide is used. The guide is longer and prevents from the chain being derailed in a rut or on other obstacles. This one of the many pieces that are available to the public for sale on their website. A DID chain and Pro Taper sprockets are used on Justin’s bike. Justin is very particular with his sprockets. Currently he is running a 50 tooth. The rear wheel position is different from Chad Reed and Justin. Justin is running his wheel much further toward the front in comparison to Chad. The real axle is a stock Suzuki piece with Factory Suzuki Japan axle blocks and axle nut. Out back you will find a Factory Suzuki rear hub/spokes, Excel hoop, and 120 Dunlop rear tire. Chad Reed and several other 450 riders have gone to a 110 rear tire. Looking closer at the Guts seat you will find that the team has made their own bracket that is reinforced and made out of titanium for more durability. Complete rear brake set up is all Factory Suzuki Japan. Rotors, master cylinder, brake pads etc is all factory. The rear brake pedal is made at JGR with a factory titanium brake tip. A factory rear master cylinder is used on Justin’s bike. The window is placed behind to keep it from being damaged by debris or other motorcycles. On the rear brake pedal the spring is mounted in a different position to get it out of the way and make things easier to access and remove if needed. The cleavace on Justin’s bike is also a Factory Suzuki Japan piece. You will notice on the piston for the rear brake is a gold color. It is a titanium piece and holes are drilled into it for heat displacement.. This also helps with durability purposes. 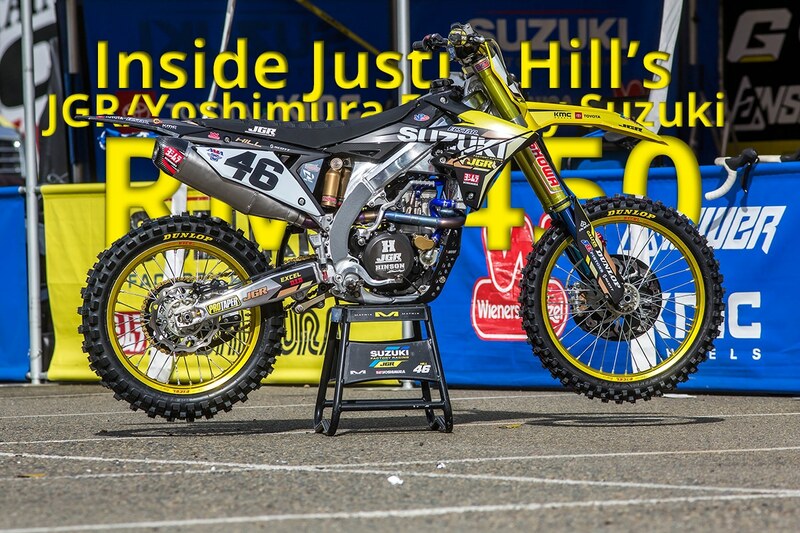 A complete Yoshimura Titanium exhaust system is used on the entire JGR team. The exhaust is tailored to each bike and can be changed upon request. On the OEM Suzuki RMZ450 you will find the BFRC shock. On Justin’s you will find a Factory Showa shock top to bottom. The JGR linkage system is made in house at JGR and is available for purchase. There isn’t anything too crazy on length or material that Justin uses. The opposite side of Justin’s race bike featuring Hinson clutches, Yoshimura exhaust, grip tape on the frame, and a boat load of titanium. Like a lot of the factory teams, Justin runs a brake snake on his bike to prevent the tip from being ripped off or bending. This also keeps from material getting trapped between the clutch cover and the brake arm itself. Justin is the easiest rider that Brad has worked with as far as clutches are concerned. He is extremely mellow on the clutch and does not ride hard on them. The water pump covers are also a Factory Suzuki Japan piece. An 02 sensor or “O2 Bung” is located on the Yoshimura exhaust header. This is a data acquisition piece. This helps the team gather information on the motorcycle to better fine tune the Factory Suzuki ECU for their fuel map. The little entry port next to the front shrouds is for data acquisition. The team can connect their computers to this port and get readings like water temperature, engine temperature, air, etc. This is used more for safety than anything else. Fixing a problem before its a real problem can keep the bike racing and the rider safe. Behind the shroud you will also see a fan system for extra cooling. It is a similar set up that the team uses for outdoors. The fan was placed on the bikes for this weekend specifically for the mud and rain. To protect the engine even more, the team uses a full coverage skid plate that is carbon fiber and does have holes in it for weight as well as helping with air flow. Armored Graphics provides all the decals for the team and is close to the team in North Carolina. This helps with getting things changed on the fly and working on new designs. UFO is a new team sponsor this season and provides all the plastics to the team.